I loved the chemistry between Mercy and Kalu. It was very realistic and slow burning. I could feel the sexual tension between them increase in every scene I usually love Kalu but he was not on point here. There was a scene where Kalu was supposed to be sick and it was soooo fake. He was smirking and laughing all the way through. What was it that he kept laughing at? 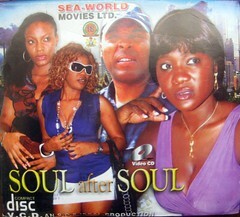 It was super annoying especially since he is one of Nollywood’s great actors. They should have reshot it. This wasn’t the only scene where he seemed to be laughing under his breath or smirking where it wasn’t appropriate. Just when you think they will have a story that shows your life will not end if you cannot have a child you realise that Nollywood can never have a story like that. So kudos for showing a man being infertile and accepting it but I gotta take kudos away on the other hand because Frank got killed off as if to say the fate of death is better than living as a sterile man. We don’t see Angelina and Frank adopt a child or Vincent and queen have a happy life with the one that they already have as I would have liked (Think outside the box NOLLYWOOD. Introduce NEW ideas and ways of thinking to people) Oh no instead of this we see the ones who are not able to have a child quickly killed off. Wow! Does that mean you are better off dead that living in African society unable to bear your own biological child? This may just be one movie but when the same message is being preached from film to film you cannot help but to think that that just may be the case. Vincent is not yet ready to forget Vanessa and perhaps sleeping with Angelina made him feel feelings of guilt that he didn’t like. Feelings that made him feel like he betrayed his late wife. I am sure that this is something that many people who have lost a partner go through even when they wait years to remarry. I loved the uncle’s role. Too often in African movies we will see a woman chastised for wanting to be with another man after the death of a husband. I loved that he as a man was so supportive and encouraged Angelina to find happiness with Vincent. How does Mercy know she is Vanessa? This is never explored or mentioned or thought about. I found that it did not slot into the story very well. I felt that there should have been more focus on that angle. Why didn’t Angelina’s sister notice her difference in mannerisms and character? We know that Vincent noticed that she had similar mannerisms to Vanessa so why wouldn’t her own sister and uncle and friends notice? We see that Angelina gets attached to Vincent and his daughter Kelly so quickly. Strange that she never unwittingly mentions little things that her and Kelly used to do together etc. We never even see her thinking about that? Where has the spirit of Angelina gone? Why does Angelina’s friend ask her why she looks like she never been to her sister shop. I wanted to yell at her, “She got amnesia byatch!” I mean what was it suddenly forgotten that she had amnesia? And then she acted like she did remember which was strange considering she was supposed to have amnesia. Angelina reveals to Vincent that her body in fact contains Vanessa’s spirit. I found this scene to be very highly charged and emotional. Why has this kid of about 4 years old (Kelly) got a straight perm? Slick back hair AND a fake ponytail??? Say What? I would recommend this movie. I liked the movie because it was one of those simple feel good movies. I liked the idea of the story and the acting and relationship between the characters was great for the most part. It was however very predictable. 30 minutes in and I knew Angelina and Vincent were going to get it on and that perhaps Angelina had the spirit of Queen in her. The other thing I had a problem with was Kalu’s smirking and that I didn’t think that the whole spirit thing was properly thought about. Nevertheless it is worth watching.